Andes Battle of the Bands Broadcast! | Andes Works! Hello, Seattle – The Great Rift! 12noon to 4pm – First Round – All bands compete for the 4 final round spots broadcast live on WIOX. 12:30 – BBQ Lunch – Andes Fire Department cooking hamburgers and veggie burgers. 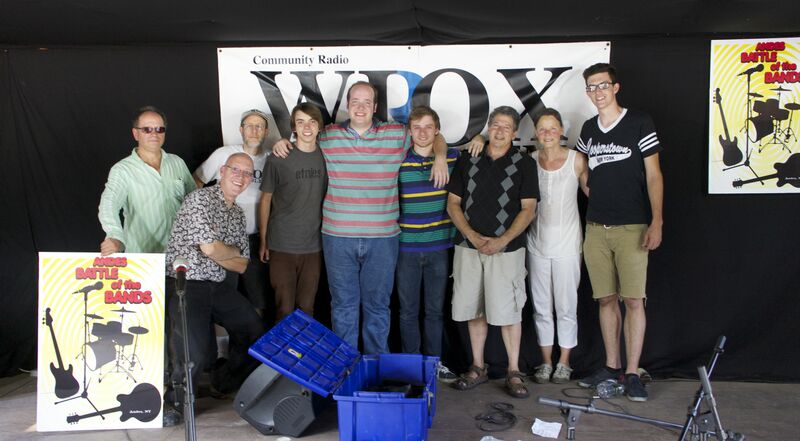 6pm to 8pm – Final Round – WIOX Radio will Broadcast LIVE the final competition between the 4 bands. Atlas Arrows Indie Rock Band from Binghamton, along with members of WIOX Radio and Andes Works! The first annual Andes ‘Battle of the Bands’ was honored to provide a venue for six talented bands to perform! Participating Bands: P2 (Stamford); Avid Rox (Walton); Hello, Seattle (Oneonta); Atlas Arrows (Binghamton); Nuclear Fusion (Stamford); The Mutton Chop 5 (Cooperstown). WIOX hosts Jezz Harkin & Terry Doyle gave a flawless simulcast! I’m listening in to The Battle of the Bands show right now from 93.1 !! I’m not in the area, but I wish I could be there at the show. I’ve heard Hello, Seattle play a lot and I was hoping you could let them know I’m listening in and I think they rock! The lyrics are especially unique and fresh. I love this band! Michelle D.
“Hands I Know” from Atlas Arrows will play on the ‘imprint’ program this week…. AND Atlas Arrows, Hello, Seattle and Avid Rox on the Crackle show – Wednesday between 3-4pm. Gotta get band. 2013 in Andes ! Gotta Band? Want to perform in 2013? Leave us your name & contact information in the ‘reply’ box below. Or, contact bill@andesworks.com, or susan@andesworks.com OR mail to: Andes Battle of the Bands / PO Box 342 / Andes, NY 13731. Inspired by Andes Fire Chief Joe Berghammer who wanted young people to have their own event this summer, the Andes ‘Battle of the Bands’ 2012 was sponsored by The Andes Fire Department and Auxiliary and Andes Works! with support from Kevin Prior Carpenter and The MARK Project. Co-produced by WIOX Radio and Andes Works! Gotta get band. In Andes – 2013 ! 1 Response to Andes Battle of the Bands Broadcast!